Polished steel case and link bracelet. 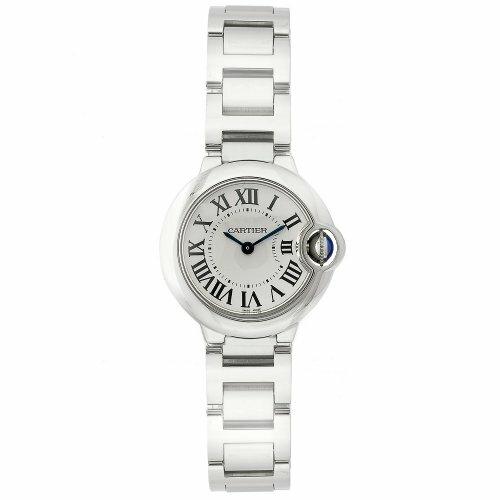 Silver opaline dial with sword shaped blue hands and Roman numeral hour markers. Fluted crown set with synthetic cabochon-shaped spinel. Battery operated quartz movement. Scratch resistant sapphire crystal. Case diameter: 29 mm. Deployment buckle. Water resistant at 30 meters / 100 feet. 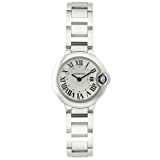 Cartier Ballon Bleu Ladies Watch W69010Z4.